Hiiiii! My name is Hannah and I do, in fact, come here often. You see, I'm the crazy one behind a lot of what goes on here at Piccadilly. This crazy party is a result of the overflow of my mental glitter and confetti and I L-O-V-E sharing it with you. Since I don't have the privilege of sitting down to coffee with each of you, I thought I'd take a minute a share a few random things about myself and answer a few questions that I've received. What inspired you to start Piccadilly? I grew up in an entrepreneurial family. I didn't realize it at the time, but looking back I can see clearly how growing up in a family of "dreamers, creators and starters" inspired me from day one. My Grandma Betty, who I talk about a lot around here, was the specific inspiration for Piccadilly as she had her own magical thrift store named the Piccadilly Emporium. I loved visiting her and the shop and watching how she loved people. She was an amazing business woman and her unassuming shop enabled her and my Grandfather to leave a legacy of blessing to so many people. What's more, she let me read as many Archie comic books as I could carry. In addition to my Grandma Betty, my mom was also an inspiration. A true artist at heart; for as long as I can remember she has always been creating something. My dad, as well, has always been an out-of-box thinker who approaches the world with a "why not" point of view. His mother, and my Grandma Judy, comes from strong Scottish roots (as she reminds me), raised three children and then decided to go back to school to, not only get her a B.A. but, also her Masters in area of passion for her. She's still creating to this day and constantly inspires me to go further. As you can see, there's inspiration ALL around me. I couldn't help but create something myself. Why are you so passionate about parties? I do love a good party. I've been known to geek out over the perfect pinata and research for hours to find just the perfect plate and cup combo, but what I am REALLY passionate about, even more than those things, is people feeling valued. I realized awhile ago that while I could (and will) try to tell as many people as possible in my lifetime how amazing they are and how much their individual contribution to the world matters; I will be much more effective if I can empower others (YOU) with the resources and reminders to let the people in their world know how much they appreciate and value them. I can absolutely tell your coworker that they're crushing it at work, but just think how much more impactful that would be coming from you because you better understand the context. So THAT is what I'm passionate about. Helping you communicate value to the people in your world. Whether it's providing you with everything you need to throw an amazing party for your family and friends or a gift to let someone in your world know just how incredible they are. I'm here to help. I'm enough of an idealist to believe that if we each start celebrating the people in our lives with more intention we can start a ripple effect that can actually change the world. It really, truly, with sprinkles on top, is that simple. Ummm Flamingos are great and all but what's with the obsession? Beat's me. I've just always loved them. Maybe it's because they are pink or that their general awkwardness speaks to me on some subconscious level, but I just love them. Always have. Also a group of flamingos is called a flamboyance and I just really, really think that is wonderful. What made you decide to move yourself AND Piccadilly from DC to Miami? Ohhh this is a tough one... or maybe it's not. Again, after 16 years in DC, I just knew it was time for a new adventure. I had traveled to Miami many times and simply put, I fell in love. I fell in love with the city, the people, the bright colors, the warmth and it's exuberant energy that it emanates. Those friends who know me well just said "Finally! That just makes sense." when I told them I was moving. As you can tell from the Piccadilly brand, bright colors, tropical vibes and a good dose of irreverent quirk are just...me. Also, and more importantly, as a person of faith, I believe that God is guiding my life. I prayed a lot about this decision. Uprooting from community and a life that I had spent years building was not an easy choice or something I could just do on a whim. I wanted to know that there was greater purpose for me personally, as well as for Piccadilly, if I made that move. Every time I prayed I came back with a resounding yes. This was the right decision and the right move for me. After nine months here in Miami, I can honestly STILL say that it was the right choice. I fall more in love with this place every day. There's definitely a few things that I'm pretty excited about right now. Although it's been nine months, I'm still in the process of making my apartment, which I affectionately call the Flamingo Nest, feel like home. I'm currently obsessing over gallery walls because I'm working on compiling one in my living room. I've been having so much fun pulling out prints and postcards and other odds and ends that I've collected over the years and seeing how they all play together. Also, PRINT MIXING, like, I can't get enough of it. I'm going to be posting more about that soon but I'm just in love with print mixing for this season. Especially, bright and floral prints.. (no surprise there). Lastly, my church has just released its first single off of their first EP last week and I've literally been jumping around listening to it since then. You should totes check it out here. It's so fun! Now that I've shared a bit more about myself, I'd love to hear about YOU! Leave me a comment and let me know what brought you here and some other fun randomness about yourself. 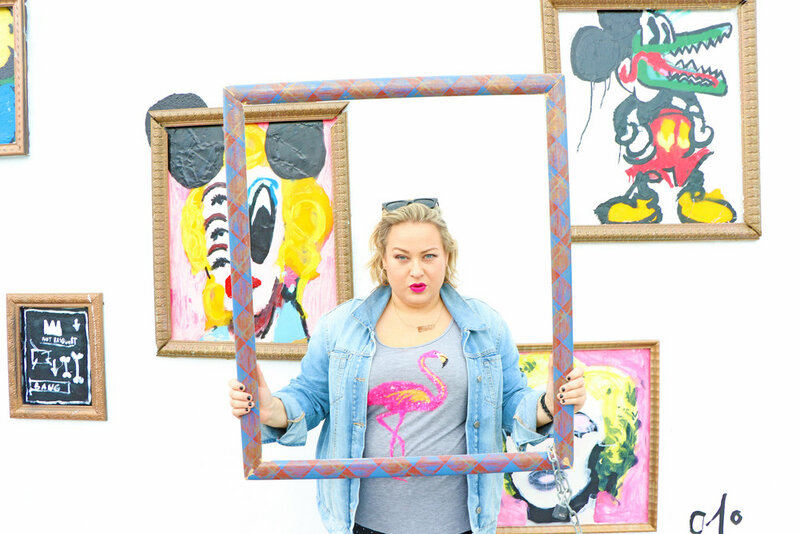 All photos were taken by the ever fabulous Francesca outside of the Oliver Cole Gallery in Wynwood.